The warmer months are upon us, and you’re probably already taking your canine companion with you on outdoor adventures! Our furry friends love camping, hiking, and spending time in the great outdoors as much as we do. It’s a great way to bond with your pet and give him or her the exercise and attention they so love and deserve. Unfortunately, with the warmer weather and outdoor activities comes the prevalence of ticks—and your pet is often the victim of these nasty parasites that make your skin crawl and feed on the blood of their hosts. What’s worse, is that ticks aren’t just disgusting and a nuisance—they can carry diseases such as Lyme disease, Ehrlichiosis, and Rocky Mountain Spotted Fever. Prevention is the first line of defense. You should certainly take the proper precautions against ticks, such as applying a topical preventative product. Ask your veterinarian for recommendations on what works best for your pet. The size and breed of the dog, as well as how much time he or she spends outside might impact the suggestion your veterinarian gives you. Unfortunately even with prevention ticks are still sometimes an unfortunate part of dog ownership. Carefully checking your dog from head to toe, especially in concealed areas like the ear and underbelly after every outdoor excursion can prevent ticks from becoming embedded. What you should be feeling for is any lumps below the hair level. Be very thorough, as most ticks are barely the size of a sesame seed and are easy to miss. Embedded, they can appear to be about the size of a popcorn kernel. It’s important to check your dog over every single day, as it only takes a short time for a burrowed tick to infect its host. Here’s how to deal with the situation calmly should Fido find himself victim to the wrath of a tick. 1) If the tick isn’t yet embedded, you can easily remove it from your dog with a pair of sterilized tweezers. Also be sure to wear latex gloves any time you are dealing with the removal of a tick. 2) If the tick is already embedded grab the tick by the head or the mouth very carefully. Pull the tick out firmly and steadily. 3) ** It is important NOT to twist the tick’s body or squeeze it at any time, as this can inject more dangerous pathogens into your dog’s body. 4) Cleanse the area of the skin where the tick was attached with a regular mild soap and water. 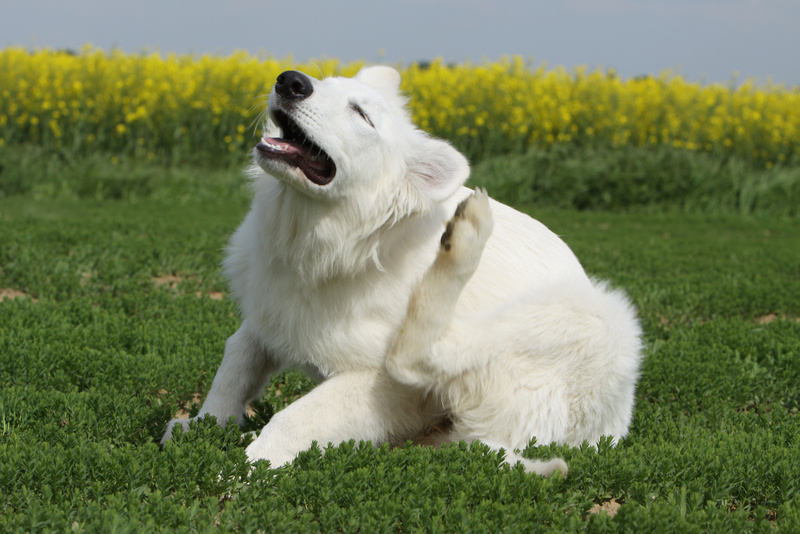 Do not apply any topical ointments to your pet’s skin. 5) If you find that a small piece of the tick remains, it’s best to leave it alone, as the body will eject it naturally over time. 6.) Be sure that the tick is both dead and also at your disposal in the event of future illness. Place the tick in a jar of rubbing alcohol, writing down the date and where your pet might have contracted the tick so it can be tested should your pet get sick. 1) Do NOT try to burn the tick out of the skin with a match, dab nail polish remover, or attempt to suffocate the tick in petroleum jelly or follow any other “wives tale” about tick removal. This could agitate the tick to project more saliva or disease-causing pathogens into your pet’s skin. 2) Inform your veterinarian that your pet had a tick and whether or not you were able to remove all of it. When in doubt, always visit your veterinarian as a precaution—it’s better to be safe than sorry! 3) The symptoms of most tick-borne diseases include fever and lethargy, weakness, lameness, joint swelling and/or anemia. If your pet ever displays any of these symptoms, let your veterinarian know right away—even if you never actually saw a tick on your pet. Remember that most ticks are simply a nuisance and disgusting, but all carry the danger of an infectious disease. If you ever feel as though a tick is too deeply burrowed into your pet’s skin, or you are simply afraid to remove it yourself, never hesitate to bring your dog to the 24 hour veterinary clinic as proper removal is the best chance your pet has at not contracting disease.